deaths from HNC were reported in 2010, accounting for 2.4 per cent of all cancer deaths. nasal obstruction, or neck lumps. The current method of diagnosing and staging of HNSCC is via clinical examination including flexible nasal endoscopy of the upper aerodigestive tract followed by radiological imaging then panendoscopy and tissue biopsy for histopathology. detection of pre-cancerous or early stage cancer, when cure is more likely as it offers the best opportunity to improve population outcomes and reduce treatment related morbidity. There is currently no available rapid diagnostic method or tool for identifying patients with HNSCC by primary care providers. compounds in a pilot study that could be used for the early identification of HNSCC. 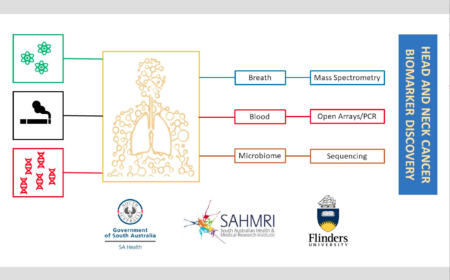 This project will expand on our existing findings, to define the continuum of breath compounds in a longitudinal analysis of patients diagnosed with HNSCC.